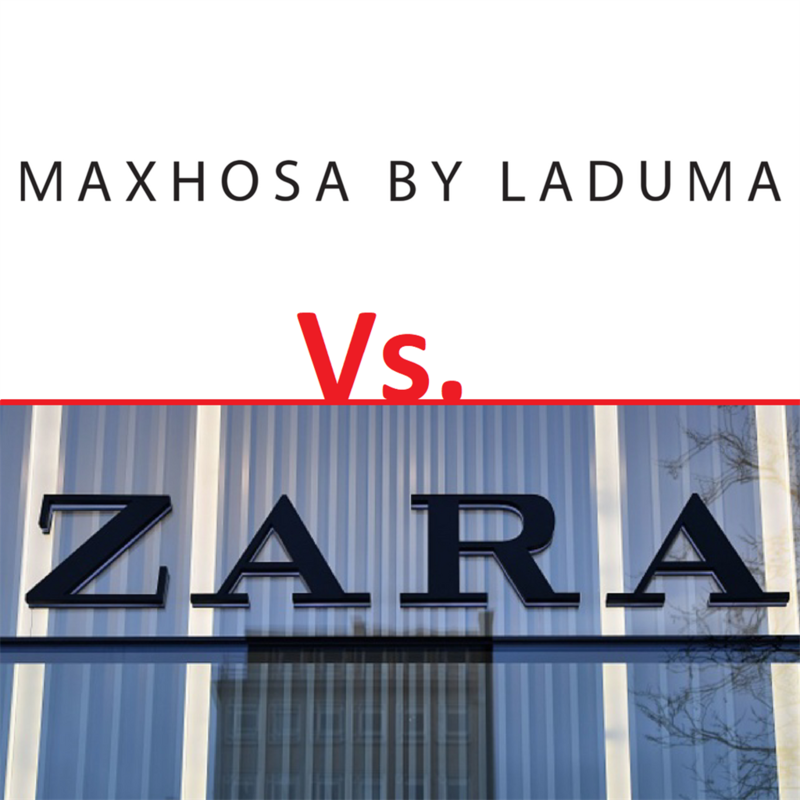 Zara has launched an internal investigation into copyright infringement claims against them by local brand Maxhosa by Laduma over its signature diamond-shaped sock collection. 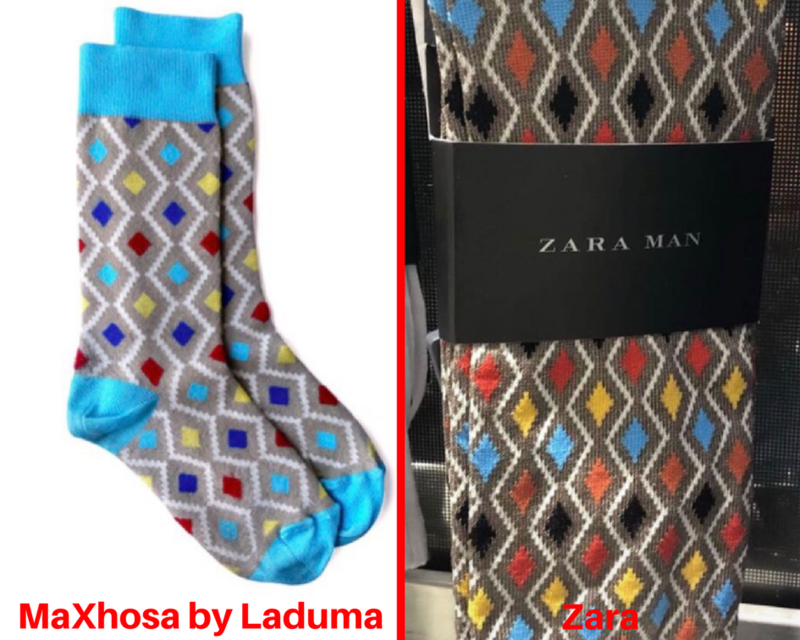 A new sock range from the global clothing retailer Zara has sparked outrage for allegedly copying MaXhosa by Laduma's signature diamond-shaped designs. The local fashion brand told Business Insider SA it has pursued legal action against Zara for copyright infringement. Zara issued a statement on Wednesday saying they have removed the contentious sock collection. International retailer Zara stores caved in to public outrage after allegedly copying South Africa’s Laduma Ngxokolo’s signature diamond-shaped design. A new Zara sock range closely resembled MaXhosa by Laduma’s Khanyisa range of cardigans and socks, and was removed from Zara’s stores (including its online platform) on Wednesday. MaXhosa by Laduma's signature diamond-shaped design (left) and Zara's new sock range (right). Zara's parent company and the biggest apparel retailer in the world, Inditex, told Times Live that "as a preventative action, the process to immediately remove this item both from stores and online was activated at the moment this situation was brought to our attention." The chairperson of the parliamentary select committee on trade and international relations, Eddie Makue, welcomed the move. "(We wish) to emphasise that authorities need to do all in their power to ensure sustainability of local producers, local markets, and local goods. The committee supports Laduma Ngxokolo's actions in ensuring that he benefits from his creative work," Makue said in a statement. Makue also suggests that the Department of Trade and Industry should see whether it could assist Maxhosa founder Laduma Ngxokolo and provide legal support to ensure that what is owed to him is paid. Ngxokolo previously told Business Insider South Africa that he, his friends and family will be returning all the products they bought from Zara as a statement that the retailer "crossed the boundary". "I do have a few Zara items that I have bought in the past, I know their business model very well. They are not 'a copy and paste' (business); they take ideas from the runway and (...) they modify or change them, and put them in the stores," Ngxokolo said. "They did not respect me as an artist who created the design. They copied it as is and didn't even modifying the design. (There's a) lack of respect for African and Southern African designers."